Stopped in on my trek across the state of MI. I sat at the bar, a really nice bar with loads of old beer labels and coasters poly'd into the top. It's fun to read them while you're sampling. I had a pint of Lochdown, formerly their Scotch Ale. Very nice, good full mouth feel, not overly sweet. While waiting for my smoked chicken open face sandwich, I decided to try their barrel aged porter. It turned out to be a great pairing. A bit pricey to take with you at $6.00 for a 12oz. bottle, it didn't stop me from taking a 4 pack home. One drawback that the pub is currently struggling with... the entire main street that they are located on is torn out and fenced, so finding the place and parking somewhere near is a bit of a challenge. 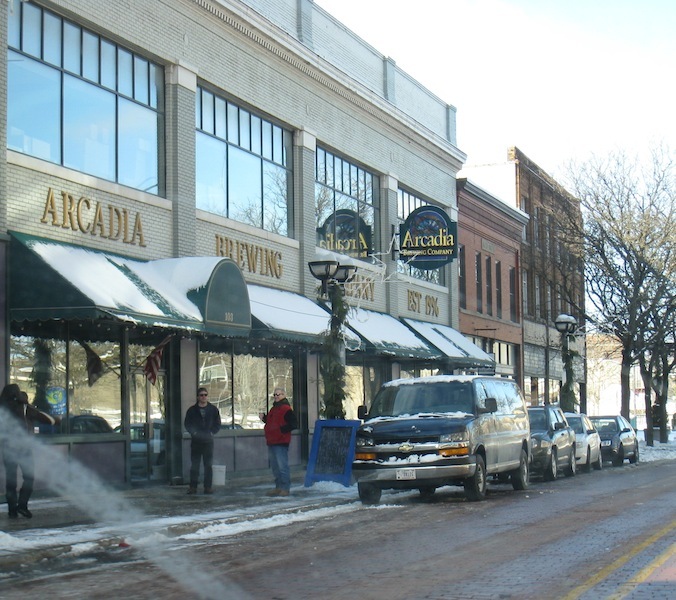 Arcadia was another stop on my Michigan beercation. Unfortunately, I could not devote an entire day to it. I believe the space is actually called TC's Pub, but I am just going to refer to it as Arcadia. It was on my way though, so we stopped in for "brunch" and a couple of beers on a Tuesday around noon. The place was pretty dead at this early hour. We sat at a table because the bar appeared to be unmanned. This place is pretty big with a variety of seating. 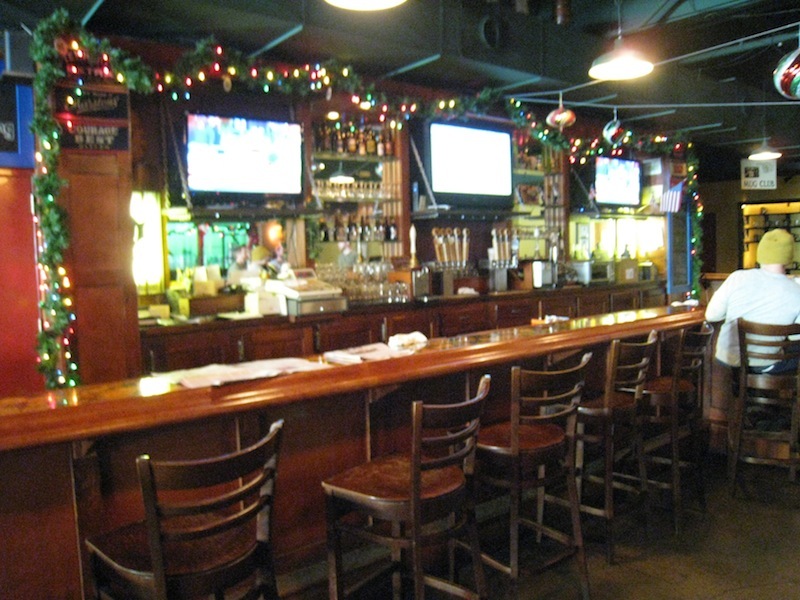 The bar is a beautiful serpentine monster with many coasters under the laminated top. When I come back again, I will have to sit at the bar. A view of the brewing and bottling operations dominates a long wall in a way that is different than the typical views of vats. There were only about 8 beers listed on tap (I forget the exact count.) The beers that I had were delicious. Unfortunately, they seemed to be out of several, so my choices were limited. I had first been introduced to Arcadia by a bottle of Hop Mouth. I was fortunate enough to get a pint of this and it was even better. I also tried the Nut Brown, which was kind of tame after my mouth had been bathed in hops, but still very good. The Scotch Ale had a bit more punch and I found it to be very drinkable. The food menu was fairly extensive with the usual pizza and sandwiches choices. A pleasant surprise was the BBQ choices. I went with the BBQ combo and I was not disappointed. The food prices were very reasonable too. Our server was pleasant enough, but I don't think she was quite awake yet. Not everyone is a morning person like me. Perhaps, lunch time is not the best time to judge this place. Overall, I had a good experience at Arcadia. I liked the beer, but I wish they had more of a selection. There was a selection of bottled beer available for take-out, so I bought several kinds to enjoy at home. The food that I had was good and the space was pleasant. I would like to return to Arcadia and get the full experience. 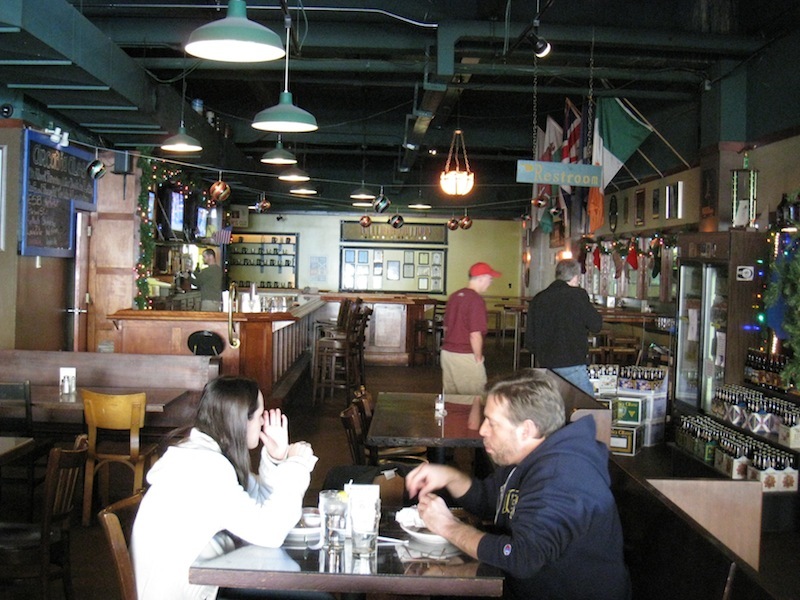 Arcadia Brewing is a nice brewpub for Battle Creek, MI. The pub is decent and the atmosphere seems good. The beer, however, was only so-so. I ordered the beer sampler which contained around 10 beers, including a wit, a porter, a stout, IPA, pale ale, their cocoa loco, an ESB, and more. The ESB was not very hoppy, but it was sweet. I would rate it as okay. The stout had a deep dark color and nice head but little taste. The IPA, while not as bitter as an IPA probably should be, was their best beer. It was somewhat fruity and slightly more bitter than a pale ale. I would recommend it. 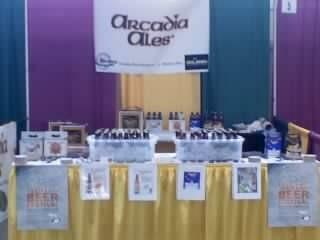 If you happen to venture into Battle Creek, I would check out the IPA at Arcadia.